If Staten Islanders have felt left out of the subway rat race all these years, they’ll soon be able to get in on the action without leaving their home borough. The developers of the massive New York Wheel–the 60-story Ferris Wheel on the Staten Island waterfront set to become the tallest observation wheel in the world–have announced that a simulated subway ride will be part of the waterfront complex. Time Train, as it’s officially being called, will be a 4-D theater experience that will provide a visual tour of New York’s history with a focus on the harbor. Additionally, a webcam will be installed on the nearby Robbins Reef lighthouse to offer a 24-hour look at construction of the wheel, which will boast four mobile bar cars and a 20-seat restaurant. 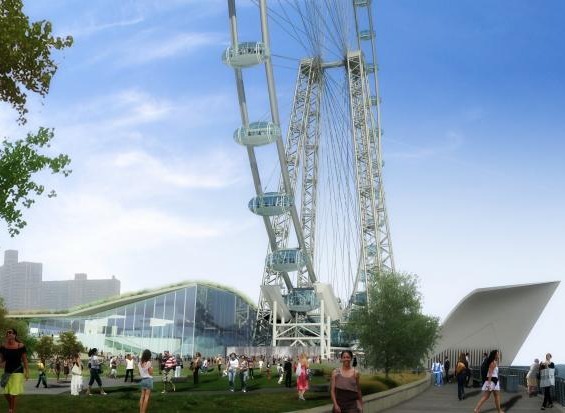 Groundbreaking for the wheel and its neighboring attractions–including a floating swimming complex, a hotel, and a large outlet mall–is set for 2015 with completion planned for 2017. To see more new developments happening on Staten Island, click here.